NOW, THEREFORE, I, RICHARD AA. NIXON, President of the United States of America, do hereby authorize and direct the Secretary of State to invite, on my behalf, such foreign countries as he may consider appropriate to participate in this international exposition. "CELEBRATING TOMORROW'S FRESH NEW ENVIRONMENT"
Glistening islands and riverbanks of the Spokane River, open spaces with colorful plazas, dancing fountains, gardens and greenery, worldwide paviWons and exhibits. All created to illustrate that Man can live, work and play in harmony with his environment. On this theme, Expo '74 is intended to stimulate greater understanding of our environmental problems and their solutions. 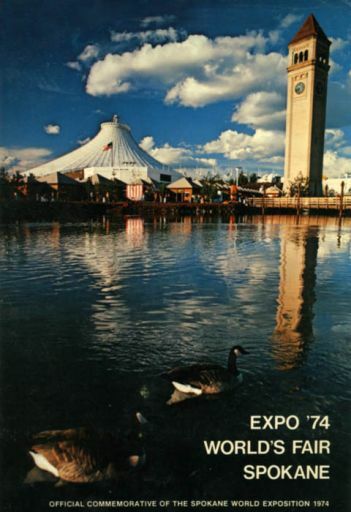 Located on Havermale and Cannon Islands on the Spokane River, Expo '74 is the first international exposition to be held in this country since the United States became a member in 1968 of the Bureau of International Expositions, the Paris-based world organization for the coordination of international fairs. 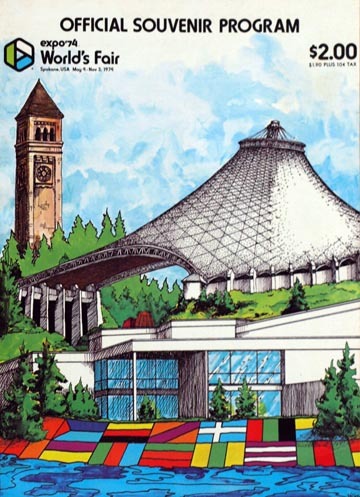 In November, 1971, the Bureau of International Expositions approved the plans for Expo '74 in Spokane. The United States Government then agreed to build a federal pavilion as a keystone to draw other nations to Expo '74. The site was dedicated on May 8, 1972. Expo '74 was officially opened. May 4, 1974 and was designated as the official celebration event by the American Revolution Bicentennial Commission. With its blue skies, green grass, trees, foliage and the sound of clear, clean rushing waters of the Spokane River, Expo '74 is "The greatest concentration of environmentally-oriented displays in one place." Mr. Renee Chalon, Secretary General of the Bureau of International Expositions stated, "The Spokane International Exposition is exceptionally relevant to the time in which we live. The Exposition treats the problem of safeguarding the blessings which Providence has generously given to all men and which man, in his improvidence, seems determined to destroy, damage or pollute." On May 4, 1974, in Spokane, Washington, the curtain rose on one of the most ambitious and daring projects ever attempted by an American small city—Expo '74. Startling in its concept, innovative in its theme, optimistic in its location, Expo '74 was the first World's Fair on the Environment and the only International Exposition to be held in the United States during the Bicentennial Decade of the 1970s. During the long months of planning and building, it often seemed both to its creators and to the rest of the nation an impossible dream. On many occasions it nearly faltered and died. Time after time, agonizing decisions gave it the breath of life for a few more weeks. Its successful accomplishment in a remote corner of the Pacific Northwest, without substantial outside financing or involvement astonished the world. Expo '74's overwhelming success is a tribute to the dedication, the hard work, and the vision of that handful of men and women of Spokane who didn't know what it meant to quit. And, it serves as a beacon that the can-do spirit still thrives in this country. Naturally, it is impossible in a volume of this size to credit each of the thousands of individuals who were responsible for Expo's success. Expo '74 and Spokane will forever be indebted to the hundreds of volunteers who largely went unsung and to the dozens of prominent and influential citizens who made the crucial contacts, attended the late night meetings, and gave freely of their valuable guidance and counsel, but who chose not to seek the limelight. This volume is a look at the Fair the way it was—184 days when Spokane gave the world color, excitement, and a serious environmental purpose.